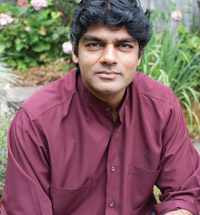 Dr. Raj Patel is an award-winning writer, activist, and academic. The author of the internationally acclaimed books Stuffed and Starved: Markets, Power and the Hidden Battle for the World's Food System and the New York Times best-seller The Value of Nothing: Why Everything Costs So Much More Than We Think (HarperCollins Canada), he has worked for the World Bank, the World Trade Organization, and the United Nations; he has also waged international campaigns against each. Why do things cost what they do? 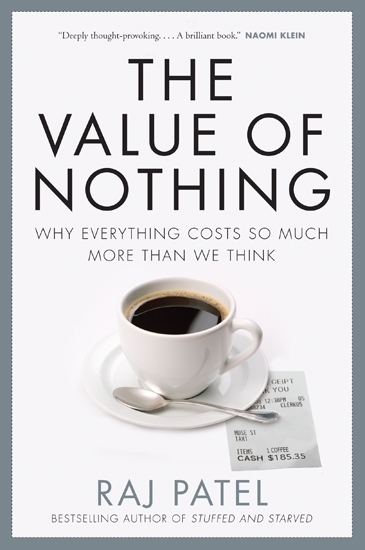 In his new book, The Value of Nothing, Patel examines the reasons through history, philosophy, neuroscience, and sociology, revealing why prices are always at odds with the true value of things that matter most. His first book, Stuffed and Starved, also combines global economics and social justice, as he uncovers the secrets of the world's food systems. From farm to fork, Patel follows the specific journeys of coffee, soy and high-fructose corn syrup and opens the doors to the kitchens of fast-food restaurants. What he uncovers is the shocking story of commercial greed and helpless hunger that has become a key ingredient in everything we eat. Currently he is a Research Professor at the Lyndon Baines Johnson School of Public Affairs at the University of Texas at Austin, and a Senior Research Fellow at the Unit for the Humanities at Rhodes University, South Africa. Patel has degrees from the University of Oxford, the London School of Economics, and Cornell University. He was a visiting scholar at UC Berkeley's Center for African Studies, an Honorary Research Fellow at the School of Development Studies at the University of KwaZulu-Natal and a fellow at The Institute for Food and Development Policy, also known as Food First. As well, Patel has testified about the causes of the global food crisis to the US House Financial Services Committee and is an Advisor to the United Nations Special Rapporteur on the Right to Food. Patel regularly writes for The Guardian, and has contributed to the LA Times, NYTimes.com, The San Francisco Chronicle, The Mail on Sunday, and The Observer. His forthcoming book Seven Cheap Things: A Short Introduction to World-Ecology, is co-authored with Jason W. Moore and will debut in 2017. He is also working on a major documentary project with Steve James (director of Hoop Dreams) about the world food system entitled Generation Food. "Raj Patel was one of the most outstanding speakers we've had on campus. His writings on the global food crisis are timely and directly tap into students' lives. His book is accessible . . . He can speak to groups large and small about food and its impact on our lives, poverty and society around the world." "Raj was simply fantastic and we learned a great deal from him. We could not have asked for a better speaker!" "As we confront the crisis in the worldview of orthodox economics, Raj Patel offers us a whole new way to think about price and value. Bracingly written and full of surprises, The Value of Nothing is itself invaluable, showing us a path out of the darkness of the economic woods." "With great lucidity and confidence in a dazzling array of fields, Patel reveals how we inflate the cost of things we can (and often should) live without, while assigning absolutely no value to the resources we all need to survive. This is a deeply thought-provoking book about the dramatic changes we must make to save the planet from financial madness - argued with so much humour and humanity that the enormous tasks ahead feel both doable and desirable. This is Raj Patel's great gift: he makes even the most radical ideas seem not only reasonable, but inevitable. A brilliant book." "With The Value of Nothing, Raj Patel has done something of great value: in language utterly clear, concise, literate, and engaging, he takes readers through the murk and mess of the economy's collapse. He shows the hows and whys, how we seem bent on a repeat (no real substantive changes to the practices that got us where we are, at the policy level), but also how we, in our communities, if not larger concerted efforts, have some power to right the course. What Raj Patel did so brilliantly with food in Stuffed and Starved, he now does so with money and the economy." "In this riveting eye-opener of a book, Patel dismantles with great fluidity and precision the reigning theory of the free market and its applications: how it creates in our global society deep inequalities of power, based solely on the diktat that our fundamental needs (water, decent food, housing, health care) are worthless because not profitable, and thus leading to economic chaos and a loss of community empowerment. But there is also hope in the emergence of social groups around the world who are insisting and reclaiming 'the right to have rights' through their democratic engagement. Patel brilliantly shows us how both a fairer society and a sustainable economy are possible as long as we are willing to seize back our freedom to choose from colluding governments and corporations. The Value of Nothing should be required reading for any self-respecting citizen of the world." "Magisterial . . . this is the kind of book from which you emerge enlightened, surprised, angry and determined." "Patel's range is impressive . . . This is a book full of insight, that makes an important contribution"
"Patel successfully connects the dots of seemingly disparate issues like hunger, obesity, free trade, rural depopulation, and food safety to create the picture of a food system run by corporate greed."